Gain strength, clarity, and a deeper knowledge of yourself on this eight day mountain adventure with Yoga and Trek Retreats. Ravi and Gabba-Ji are ready, willing, and more than able, to help facilitate your trip to India! “I’m Gabba-Ji, and I lead adventure retreats with environmental and social initiatives. My retreats are inspired by a love of travel and an appreciation for our earth. My goal is to provide socially conscious and environmentally responsible travel around the world, to the world. My mission to create sustainable retreats with social and environmental impact, came through my experiences travelling through the Himalayas in 2015, 2016, and 2018, and a strong will to eradicate litter and pollution by taking action through cleanups and spreading change through education. 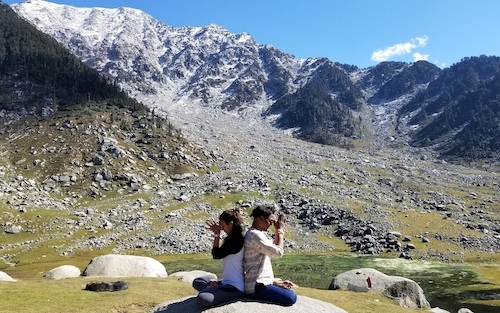 More about the retreat: Immerse yourself in the tradition of yoga, trek to an awe inspiring glacial lake atop a mountain, make a difference at a local school, and connect with people from all over the world. A total of four nights in Macleodganj, Dharamshala. Three nights in the great outdoors with the comforts of a cedar fire, cozy tents and blankets, and meals made with fresh and + locally sourced ingredients!